The findings of this study indicate that the architecture of the Diebold Precinct-Based Optical Scan 1.94w voting system inherently supports the alteration of its basic functionality, and thus the alteration of the produced results each time an election is prepared. 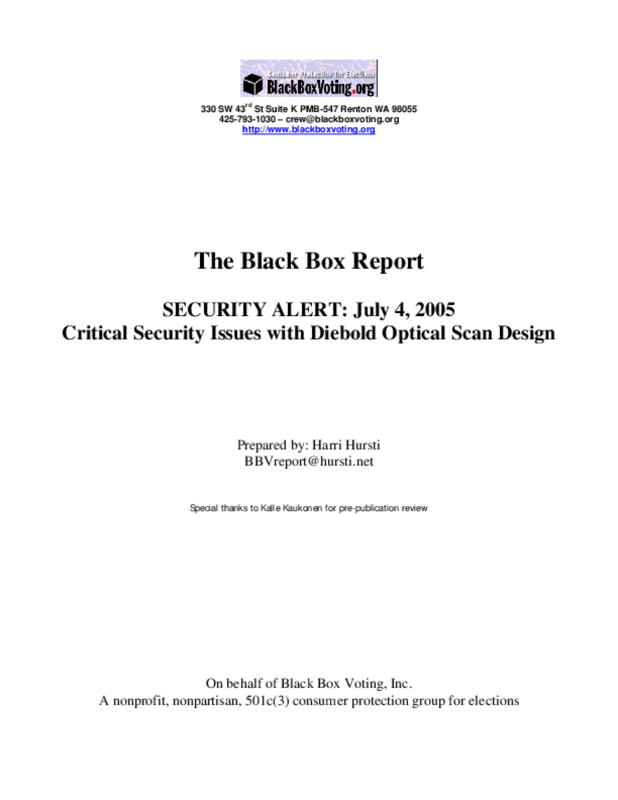 The fundamental design of the Diebold Precinct-Based Optical Scan 1.94w system (AV OS) includes the optical scan machine, with an embedded system containing firmware, and the removable media (memory card), which should contain only the ballot box, the ballot design and the race definitions, but also contains a living thing -- an executable program which acts on the vote data. Changing this executable program on the memory card can change the way optical scan machine functions and the way the votes are reported. Whereas we would expect to see vote data in a passive environment, this system places votes into an active environment. With this architecture, every time an election is conducted it is necessary to reinstall part of the functionality into the Optical Scan system, making it possible to introduce program functions (either authorized or unauthorized), either wholesale or in a targeted manner, and there is no way to verify that the certified or even standard functionality is maintained from one voting machine to the next. Copyright 2005 -- Black Box Voting, Inc.